Yes, the buck had a birthmark shaped like a bullseye. A terrible predicament once hunting season started! He would be the obvious target! legs. One of them had a series of concentric circles on his chest, which looked like a bullseye. 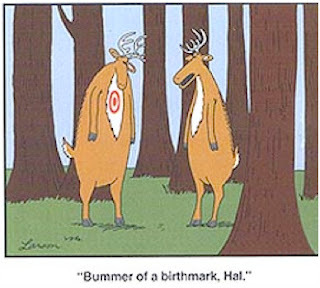 The other remarked to him, "Bummer of a birthmark!" Once He was baptized in the Jordan by John, Jesus became this obvious target. The devil set his sights on the Lord, and would unleash everything he had to try and stop the Savior. He had been a target all along, and Satan knew that this was the Son of God. But now, He was baptized, and His ministry was commencing. More than ever, it would be important to Satan to put an end to this saving mission of God. So the old evil foe takes Jesus on. He confronts our newly baptized Lord and tempts Him. Satan the accuser twists and turns and manipulates the Word of God, providing temptation for Jesus to endure for forty days in the wilderness. There He was, the new Adam, with the wild animals, just like our first father was with the animals in Eden. Only in that lush Garden, the first Adam fell for Satan's manipulation of God's Word to tempt him. Now in the wilderness, the New Adam, not so much -- in fact, not at all! This whole event sets the stage and serves to foreshadow this showdown between Satan and Jesus. Here Christ refutes the devil and stands firm against temptation. He is defeating sin. And later, at the cross, the Lord brings that defeat of sin to completion, crushing sin, death, and the devil by His own suffering and death! But wait. "Sure," you say, "that's easy for Jesus!" But what about you? How do you do in the face of temptation? You see, at your baptism, you received a birthmark too. And it also was a target! But this target is cross-shaped. "Receive the sign of the holy cross, both upon your forehead and upon your heart, to mark you as one redeemed by Christ the crucified." As you received new birth and were washed into God's kingdom, you became an enemy of Satan. The tempter became your sworn opponent at that moment, and wants nothing more than your eternal suffering and death, since he hates Jesus and everyone in His Church. Satan knows that Jesus defeated sin, but he and his minions still will do anything they can to tempt you to misunderstand or outright reject God and His Word. The thing is, sometimes it is not as easy as you think. Temptation can be strong, especially when it involves the things or people we love. The Lord commanded Abraham to sacrifice his only son, Isaac. But he loved Isaac. This was his son, promised by God, and given brith when Abraham was already 100 years old! Did God really say "sacrifice your son, your only son, Isaac?" I'm sure He really didn't mean that. Abraham would have been tempted not to listen to God. If Abraham had given into the temptation to refuse God, it would be a rejection of the Lord. Sometimes temptation can seem to come in the guise of pity or actually helping someone. Did you see WGN's recent story on a man named Dan Kruse? Dan has been a quadriplegic since a car accident 25 years ago. He is pretty depressed, and now wants to die. He is tempted to take his own life, but physically cannot do it. Others may be tempted to end his life. After all, he is wishing for it. Look at his so-called "quality of life." Yet, death is not imminent. Removing his ventilator would be actively killing him, and thus, a sin. Society would call that a "mercy killing." God calls it murder. Sometimes temptation can come regarding good and wholesome things, or friends and family you love. These people and things may be blessings from God. Yet when you end up placing them at the top of your priorities, and love or trust them more than God, you change the blessing into a curse. The person you love can be manipulated into an obstacle to faith. Abraham was tempted to place the son he loved above all else and say that he was a blessing from God, so he should not do as told. Instead, we see God's plan unfold as He teaches Abraham what He himself will someday do: give up His Son, His only Son, Jesus Christ, to be sacrificed. God Himself will provide the Lamb. And He did. And when He did, Isaac was spared, just as you are spared. When Abraham was at the point of sacrificing his only son, Isaac, the Angel of the Lord called out to him and stopped him, delivering God's Word to him. When Jesus endured temptation, Satan the fallen angel was harassing our Lord, But holy angels came and ministered to Him. They served Him and helped Jesus. When you are tempted, you have the blessing of knowing that His holy angels are ministering to you too. They protect you, and guard you, body and soul, fending off the old evil foe. Dear friends in Christ, your baptism and the cross traced upon you at that moment are not a "bummer of a birthmark." No, that cross has given you a most blessed birthmark that is a witness to you and others, reminding you of all that the dear Lord Jesus did for you, as the only Son, sacrificed to take away the sin of the world. He has endured temptation and remained sinless. He washes you in that guiltlessness in Baptism, gifting you with the new life of the Son of promise. Be comforted, dear tempted ones. God is your Mighty Fortress. He is the trusty Shield and Weapon that helps you free from every need that has you overtaken. He fights temptation for you. He fends off Satan and his fellow fallen angels, preserving you in the one, true faith. Because you are baptized, the kingdom yours remaineth! Amen.